Since making a wishy-washy semi-commitment, I have indeed been spending an hour (actually more!) sewing clothes for Joe the past two evenings. 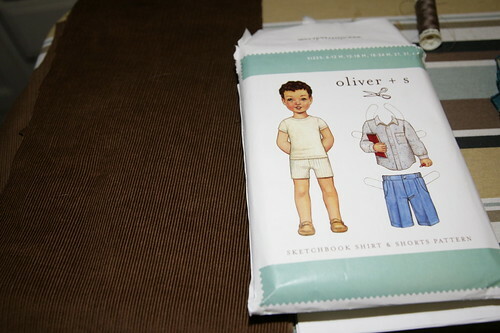 Last night, I cut out some corduroy pants for Joe, using the Oliver + s Sketchbook Shorts pattern. I've made pants from this pattern before - for whatever reason, this pattern is one of the few that really fits Joe well and isn't chronically falling off of his bottom. This time, I sized up to 3T and added some length, as his green pair is already getting short! Unbelievable! If they are too long, I may cuff them and then take them down later. The brown cord doesn't photograph very well, but it's lovely. I found it on sale at my local independent fabric store a few weeks ago, when my mom and I went shopping with the sole purpose of spending some of my Etsy shop proceeds (mad money! so fun!). It's shiny, lustrous, and has a wonderful professor's-blazer-with-elbow-pads vibe. I can never get enough of that kind of thing. I think it will make very cozy traditional pleated pants for Joe. That was easy, so in a fit of optimism, I decided to cut out a striped knit Sailboat Top as well. 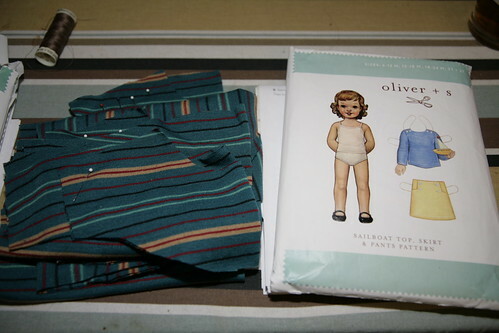 The teal striped knit is a mystery fabric given to my friend Lise. She says it was given to her at a quilt swap. She's not sure of the fabric content, but I'm thinking wool/synthetic? Or just synthetic? (It did wash suspiciously well.) Hard to say. But in any event, cute and warm, perfect for a little sweater for Joe. I have made several versions of the Sailboat Pants from this pattern (and even adapted it for shorts), but I've never made the top, despite loving the cut. I know it's not technically intended for knits, but Sascha at Piccoli Pisselli has done it and it looks amazing. Joe is such an active boy, I rarely dress him in woven tops anyway (they just don't seem as comfortable), so hopefully this will work out. Today is less interesting. This morning I finished cutting and marking (i.e., putting a few pins where buttonholes should be) the pieces while Joe watched YouTube videos of trains. 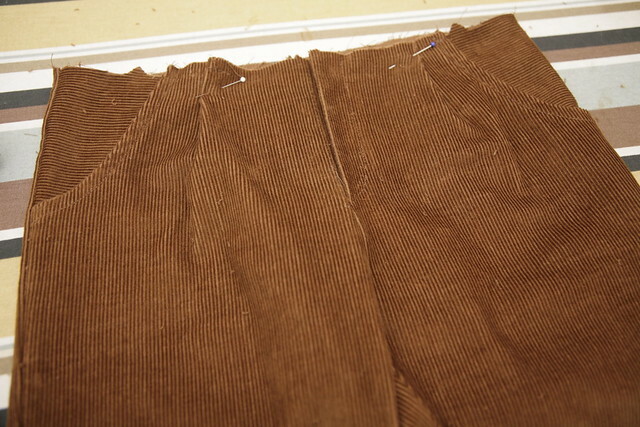 This evening, I started sewing the pants. They don't really look like it, but they are almost done - they just need a waistband and a hem now. Beyond lengthening these from shorts to pants, I made several other small changes - I cut the pocket lining on the cross grain (also the waistband), and I deepened the pockets, since Joe loves pockets, but the pockets in this pattern are a little too tight for his chubby dimpled hands to reach into. I think these are going to work out well. Hm. There's probably a reason I don't post regular updates on the state of my sewing projects. It's really boring, huh? Hopefully next time I'll have photos of cute boys wearing cute clothes, and it will be a little bit less work-in-progress. Oh, that is going to be one well-dressed little boy! Not boring at all. I am appreciating the glimpse into process. Maybe I should give myself a knitting challenge... I have a bunch of yarn just sitting there, and I did promise Robin a hat. Hey, thanks everyone!! It is kind of fun to "journal" a project instead of only presenting completed projects ... Thanks for the nice words.